Designed by Ikko Tanaka "
This is the poster for the premier of "Admiring La Argentina." 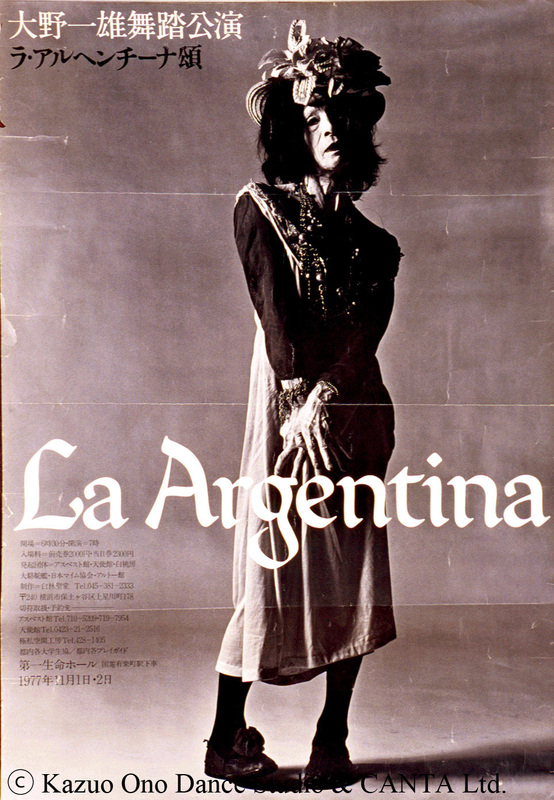 The photo was taken by Eikoh Hosoe for this poster at his studio of Tokyo Polytechnic University. Those photos taken on the same occasion can be seen in the Eikoh Hosoe's photo book "Kocho no Yume(2006)". The program which included the text by Tatsuhiko Shibusawa, was sold at 1,000 yen in the venue. There exist many relating materials, including flyers, DM postcards, photograhs on rehearsals and performances, video recordings on the 2nd day's performance in full length, newpaper articles and critics.